This year’s mandate of living consciously is off to a steady start. After changing my skincare routine to an all-natural skincare brand, I thought it was time to ramp up conscious efforts and expand to the rest of my body. Discovering new body care brands can be a daunting experience as the store shelves are packed with brands that you’ve grown to read in magazines and hear on commercials. They’re also the brands that you probably grew up with your parents using. Well, I’m going to eliminate the grunt work and research and talk to you about a 100% all-natural body care brand that I’ve begun to use from ATTITUDE. 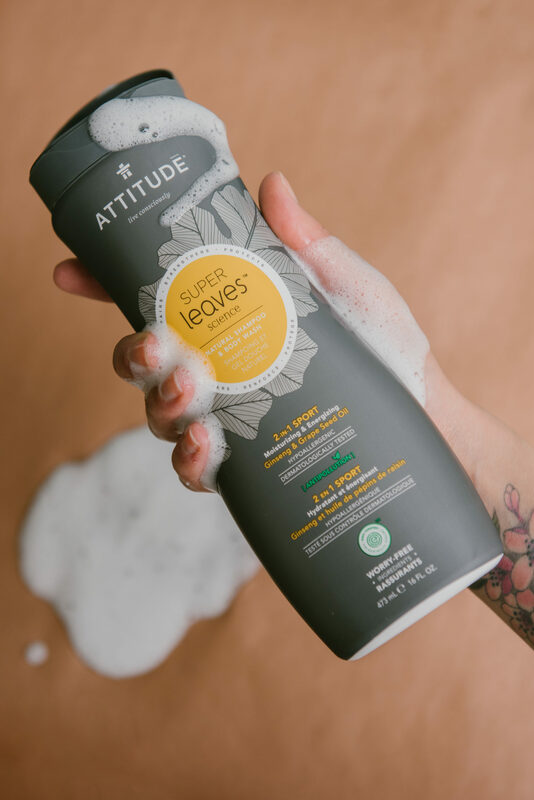 ATTITUDE is a Montreal-based company that develops all-natural products in line with the highest quality standards and distributes them in more than 35 countries. They are dedicated to promoting healthy living and offer several lines of ATTITUDE products to meet every person’s needs: Sensitive Skin, Bath & Body, Baby & Kids, Household and even Pet Care! Currently, I’m using the Sensitive Skin, Bath & Body, Household and Pet Care products and more specifically the latest Super leaves line. This line contains an extract from the seeds of the moringa oleifera, also known as the miracle tree. The extract’s active ingredients limit buildup, preventing particles from adhering to and penetrating skin and hair. It also offers cleansing and purifying properties. Below is a breakdown of the products that I’m using and can all be found at London Drugs. For more information on how ATTITUDE products are produced and impact the planet, see the notes at the bottom! 1. 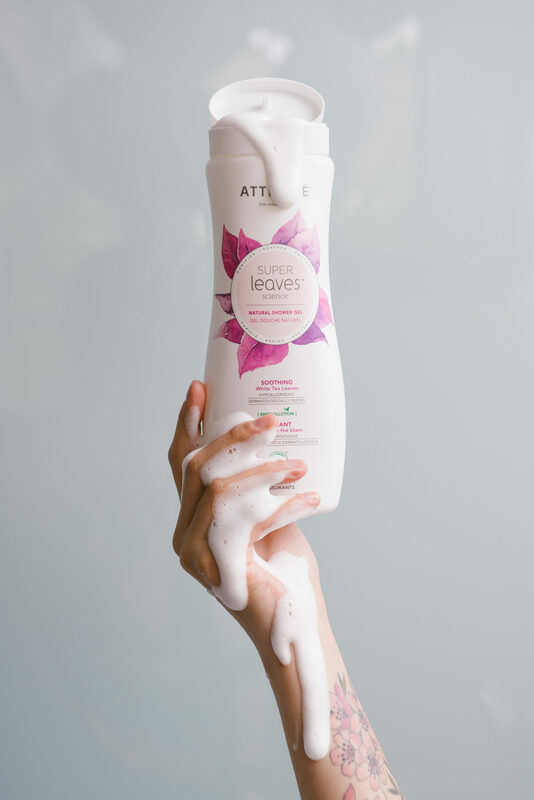 Super leaves Natural Soothing Shower Gel – I’ve used a bevy of shower gels through the years as I’m sure most of us have. We receive them in gift baskets and we run through bottles quite quickly. The Soothing Shower Gel only requires a little amount, about the size of a dollar coin and will lather your entire body. The use of white tea leaves within this natural shower gel allows for a softer feel and soothing of my skin. 2. 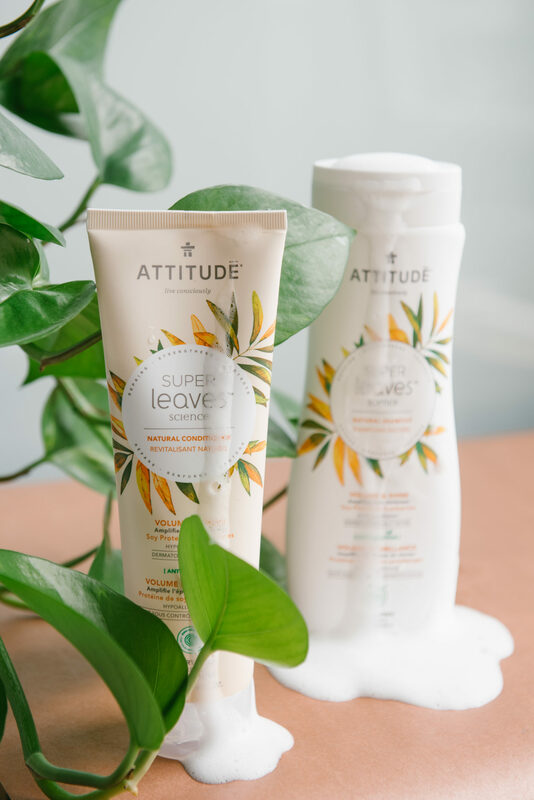 Super leaves Natural Volume & Shine Shampoo & Conditioner – I was a little skeptical about using an all natural shampoo and conditioner because my previous experiences left my hair feeling rough and “natural” feeling. It’s exactly what I thought a natural shampoo and conditioner would leave my hair feeling. After using the Super leaves collection, my hair is soft, bouncy and shiny and not at all like my previous experience! The Volume & Shine collection amplifies hair thickness Soy protein and cranberries are antioxidant-rich and help to purify, repair, nourish and smooth hair. 3. 2-IN-1 SPORTS Moisturizing Natural Shampoo & Body Wash – I like to throw this one into the mix during the week. I wash my hair about 2-3 times a week just like my skincare routine, I use an extra product to wake up my skin and hair. The energizing ginseng extract and grape seed oil are known for their antioxidant, regenerative and restorative properties. 4. Super leaves Natural Nourishing Body Cream – I really need all of the hydration that I can get! My skin becomes dry even after the use of most lotions and body creams. I could feel the Nourishing Body Cream seep into my skin and leave it feeling hydrated for hours after use. 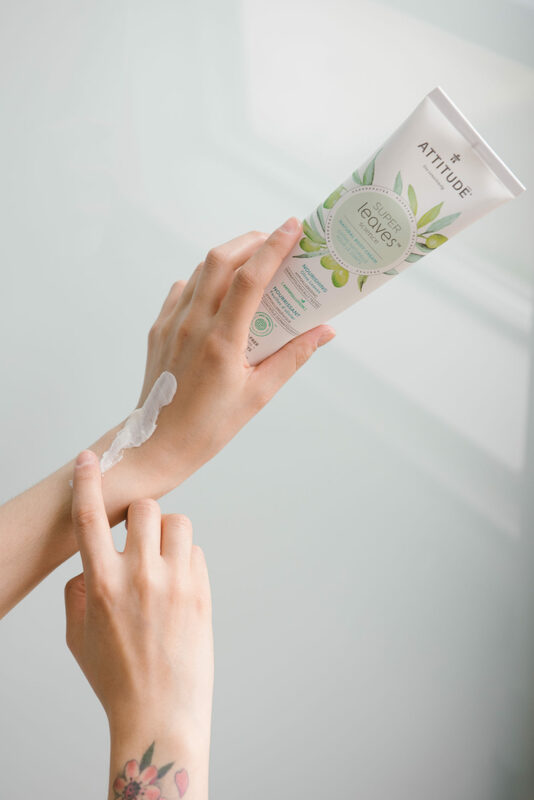 This body cream is enriched with the goodness of olive leaf extract known to help hydrate and soothe the skin. 5. Super leaves Natural Hand Soap (Orange & Lemon) – We all know how many times we wash our hands in a day and knowing that I’m using a natural product leaves me feeling at ease when I’m playing with the cats or even putting my hands in my mouth (nail biter over here!) and even prepping our food. Besides that, I don’t want my hands feeling super dry at the end of the day from all of the hand washing I’ve done. 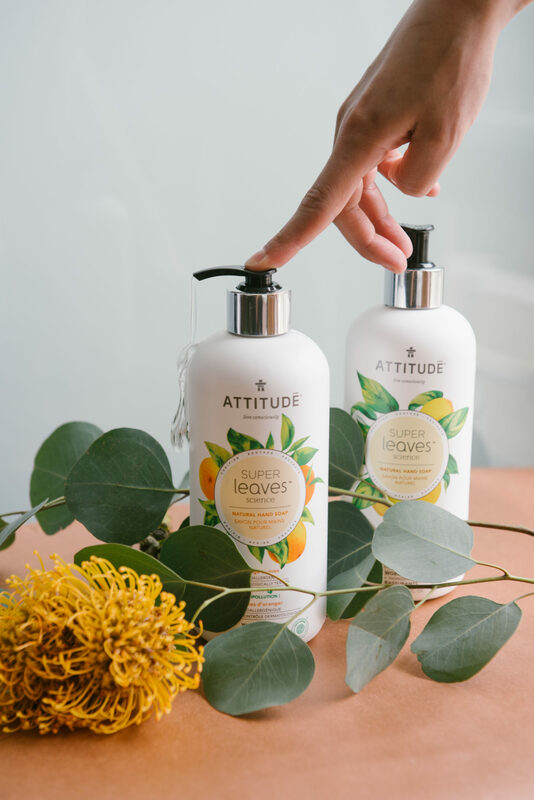 Orange Leaves Hand Soap is enriched with orange leaf extract to help refresh and restore the skin and the Lemon Leaves Hand Soap contains lemon leaf extract to help purify and regenerate the skin. EWG (Environmental Working Group) VERIFIED™ aims to be the gold standard in the health and wellness space. Based on their research on the health hazards of ingredients present in personal care products, EWG’s standards help people make healthier choices. HYPOALLERGENIC All ATTITUDE products are hypoallergenic, which means that they have minimal allergen content. In addition, our products undergo an extensive safety analysis to confirm that they are adapted for sensitive skin. NATURAL All ATTITUDE products are made of ingredients derived from mineral and vegetable-based sources. Ingredients contained in this product decrease the adhesion of pollutants and detoxify hair and scalp. CRUELTY-FREE & VEGAN All products are vegan, and therefore do not contain animal-derived ingredients. ATTITUDE is certified vegan and cruelty-free by PETA and is part of their Beauty Without Bunnies program. ECOLOGO CERTIFIED The EcoLogo® is based on multi-attribute, lifecycle-based standards, and is proof of our product’s reduced environmental impact. MADE IN CANADA Our natural products surpass all Canadian quality & safety standards.